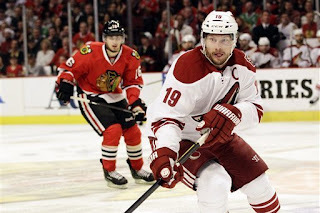 The Sin Bin Sports Blog: Which Players Deserve A Stanley Cup Ring The Most? Which Players Deserve A Stanley Cup Ring The Most? There are four teams remaining in the hunt for the Stanley Cup. However, only one team will be able to hoist the Cup and get their rings and names etched on hockey's Holy Grail. At this point in the playoffs each team believes they deserve that right, and the team that actually endures the marathon that is the NHL playoffs will have earned that right. However, on each roster their is one player that may deserve to lift the Cup more than others. That guy, when he lifts the Cup it just feels right, and most people even fans of another team will see that moment as something rightfully due. Dustin Brown of the Los Angeles Kings, Shane Doan of the Phoenix Coyotes, Dan Girardi of the New York Rangers and Ilya Kovalchuk are those guys. Dustin Brown has put in his time with the Kings organization. He was drafted in the first round and 13th overall by the Kings in the '03 NHL Entry draft and has been apart of the organization ever since. It wasn't until the '05-'06 season that Brown became a constant face in the Kings line-up, but after that Brown has only been on the rise. Brown was named the 15th captain of the Kings on Oct. 8, 2008 and has lead by example ever since. The Kings do not have a player that has given more sweat and heart to the Kings over his tenure with the club. Brown has carried his team through their current playoff run both on the score sheet and physically, and at the moment there is no one more deserving to be the first Los Angeles King to lift the Stanley Cup than Dustin Brown. Much like Brown, Doan has been apart of his team his entire career and has become the heart and soul of their organization. Doan has been apart of the Winnipeg Jets/Phoenix Coyotes organization for the entirety of his 17 year career and came right into the NHL after he was drafted in the first round of '95 Draft. Doan was only apart of the organization for one season when they were called the Jets. So, Doan has basically been in Phoenix his entire career, which might not be a good thing. Doan grabbed the captaincy during the '03-'04 season and at times has been the glue for a franchise that seemed destined to fail. Being the longest tenured player on the roster there is no doubt that Doan has put in his time, and it would just seem right if Doan were to bring the Desert its first Stanley Cup title. Girardi is the Cinderella story of the bunch. He went undrafted in the '93 Draft and eventually signed a two way contract with the Rangers' AHL affiliate, the Hartford Wolfpack. Girardi started the '05-'06 season with the Charlotte Bobcats of the ECHL and did not wait long to move up. By Jan. 27, 2007 he was called up by the Rangers and never left. Since making their nightly roster, Girardi has been a key piece of the Rangers defensive core. He is among the league leaders in average time on ice per game every season and is paired against the opposing team's top players night in and night out. Girardi recorded his first career playoff goal this season in the first round, and could hoist the Stanley Cup for the first time in his career in the same season as well. Since coming into the NHL first overall in the '01 Draft, Kovalchuk has been apart of two teams, the Devils and the Atlanta Thrashers. Being apart of the Thrashers alone should be reason enough to root for the guy to win a Cup. Kovalchuk was the captain for the Thrashers for just over a year before he was traded to the Devils. 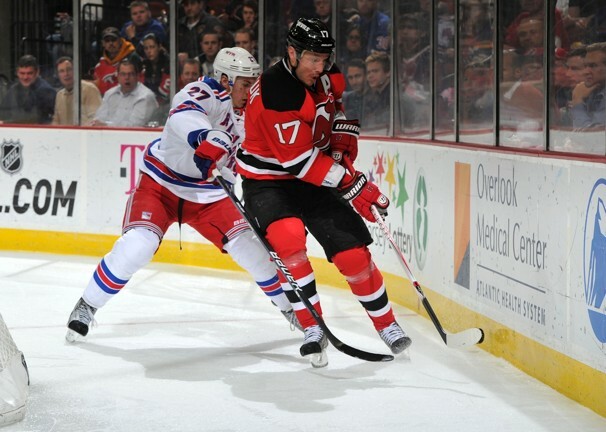 Kovalchuk has had his slumps with the Devils and his critiques have let him know about it. Before these playoffs, Kovalchuk had never been out of the first round of the playoffs. He was eliminated in the first round once with the Thrashers and once with the Devils. However, some might have the feeling that this could be Kovalchuk's year. He leads his time in points, and could be on his way to his first Stanley Cup ring.